For the language, see Gun language. A gun (also called a firearm) is a weapon used to shoot one or more metal projectiles called bullets. Guns made of wood or bamboo are thought to have been invented in China around 1000 AD. In the next few centuries they spread to other parts of Asia and to Europe where they were made of metal. Guns largely replaced catapults and bows and arrows when they became strong enough to reach out over longer distances to kill. They are of many different sizes. Some are small enough to hold in one hand. Others are large enough to sink a warship. Guns that are small enough to be carried and used by one person have the same basic parts: a trigger, a barrel, and a handgrip or stock. The trigger is pulled by a finger to fire the weapon which releases a bullet. The barrel guides the bullet which then flies to the target. The handgrip is held by the human who will fire the gun. In military terms, the more correct word "firearm" is used for the type of weapons that soldiers carry: pistols (known as 'shorts') and rifles ('longs'). Guns can be very effective weapons. Some guns fire bullets at a very high speed, which is much more deadly than an arrow or spear. They are also more effective at greater distances than arrows or spears. Bullets are usually non-explosive pieces of metal. A modern bullet is the front part of a round or cartridge. A cartridge consists of a bullet, propellant and a primer. These are packaged in a metallic, paper, or plastic case which is sized exactly for the chamber of the firearm being used. When the rear of the case (containing the primer) is struck, an explosion in the back of the cartridge ignites the propellant. The controlled explosion forces the bullet out of the barrel. Cartridges have different ways of being loaded into different kinds of weapons. Cartridges can be loaded directly into a firearm into the chamber. Or, more commonly, into a clip, a magazine or other bullet container which is loaded into the firearm. Handguns known as revolvers have a cylinder with holes that the bullets are loaded into. Modern guns called pistols are handguns loaded with a magazine. Guns have been used by armies since about the 14th century. Long barreled guns called muskets, that could be carried and used by one person, were in use by 1350. They became an important weapon in European armies about the 1600s. Modern militaries use the word "gun" for larger artillery guns that need several people, and that fire big ammunition. For example, weapons on warships and tanks are called "guns". They may be in a "turret" (a rotating base). Big guns usually fire artillery shells, which explode upon impact. In almost every country firearms are the main weapons used by armies. In modern armies, every soldier has at least one firearm as standard equipment. 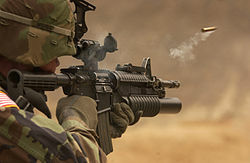 Soldiers are trained to use firearms, and to keep them clean and ready for use. Shooting is a competitive sport involving tests of accuracy and speed. They use various types of guns such as pistols, revolvers, rifles, shotguns and airguns. Shooting sports are categorized by the type of firearm, targets, and distances at which the targets are shot. Target Shooting is an Olympic sport. Since the first humans, hunting became a way of life. It was and still is in some places, the key to survival. Mankind is distinguished from other animals by the use of tools. At least 2 million years ago man learned to hunt animals for meat. They learned to create and use spears and axes. Bows and arrows were used at least 71,000 years ago. Modern hunting still uses more primitive tools. But many subsistence hunters have adapted to use modern firearms. In modern countries hunting is still allowed but is considered a sport. Hunting can be used to control the populations of many animal species. As with many aspects of gun ownership and use, modern hunting remains controversial. Handguns are not generally used for hunting. Guns can be used to kill other people. For that reason many countries only allow soldiers, policemen, and certain social classes to have them. In some countries, a person must have a special permit (or license) if they want to own a gun. Depending on the gun, people need to be a certain age and may need to meet other criteria to get such a permit. An example of this is that in the United States federal law allows buying rifles and/or shotguns at age 18—if purchased from a licensed firearms dealer. But a person must be age 21 or older to purchase a handgun—from a licensed firearms dealer. However, if purchased from an unlicensed person, with few exceptions, a handgun may not be sold to anyone under age 18. There is no age restriction on who may buy a rifle or shotgun from an unlicensed person. In the United States and other countries, people can buy guns for self-defense, hunting, and shooting sports like target shooting. In some countries, such as Australia, people who live on farms are allowed to keep guns, but it is not easy for a person living in the city to get a gun without good reason. In the United Kingdom, access by the general public to firearms is tightly controlled by law. However, this is less restrictive in Northern Ireland. After the Dunblane school massacre in 1996 followed by the Hungerford massacre in 1987, Britain passed the Firearms (Amendment) Act 1988. It required registration for shotguns and banned semi-automatic and pump-action weapons. A further ban on all handguns in mainland Britain came a year and a half later. ↑ Jim Supica. "A Brief History of Firearms". Retrieved 20 January 2016. ↑ "The Evolution of Hunting: History of Tools, Weapons, Tactics, Roles and Purpose". American Shooting Journal. Retrieved 18 January 2016. ↑ Charles Q. Choi (11 November 2009). "Human Evolution: The Origin of Tool Use". LiveScience. Retrieved 18 January 2016. ↑ Robin McKie (22 September 2012). "Humans hunted for meat 2 million years ago". The Guardian. Retrieved 18 January 2016. ↑ Erin Wayman (7 November 2012). "Early bow and arrows offer insight into origins of human intellect". Smithsonian.com. Retrieved 18 January 2016. ↑ "Does Hunting Help or Hurt the Environment?". Scientific American. 10 November 2009. Retrieved 18 January 2016. ↑ 7.0 7.1 7.2 7.3 "Minimum Age to Purchase & Possess Firearms Policy Summary". Law Center to Prevent Gun Violence. 1 October 2013. Retrieved 18 January 2016. ↑ 8.0 8.1 8.2 Peter Wilkinson (30 January 2013). "Dunblane: How UK school massacre led to tighter gun control". CNN. Retrieved 18 January 2016. Wikimedia Commons has media related to Guns. This page was last changed on 4 November 2018, at 15:10.